Glen stays a few miles outside town, at the Seapoint House, when he’s in this area. His work is hanging in rooms all over this B&B. That (and the fact that he’s here) makes it feel like home to us. Dave and I have one of Glen’s photos from this very county (County Mayo) hanging in our dining room in Portsmouth. When we arrived today, Glen was out somewhere with his camera so we wandered a bit. It was overcast across Ireland most of the day, but the colors of the moss here are always so vibrant as you can see below. Glen’s enthusiasm for this place is contagious. For dinner, he took us out to one of his favorite pubs, Sheebeen. In the photos below, you see how animated he and Dave were–until the food arrived! 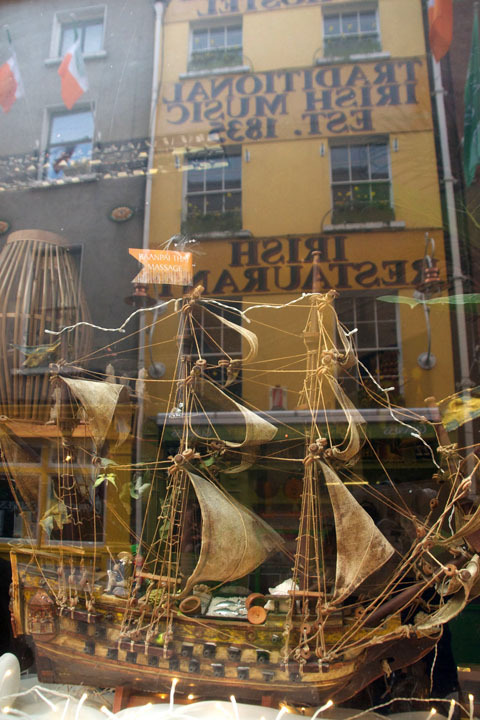 See my half-sized “lady Guinness” in the foreground above? It’s as much alcohol as I can handle (I’m actually quite the teetotaler). In any case, I’ve no idea what to make of the sandwich board we saw while walking downtown before dinner… it must be a joke? I’m really not sure what to make of this sign. 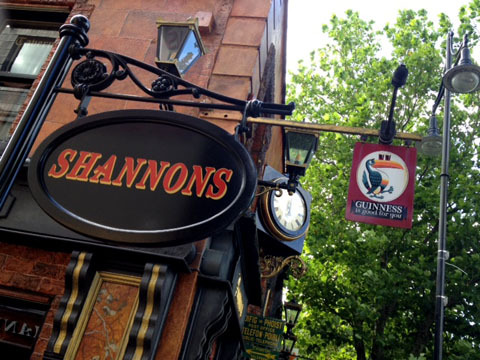 Shannons in Swords and a Guinness…. Evidentially the word Shannon is plural (in Swords, Ireland) as none of the signs we saw downtown today included an apostrophy. After snapping some pictures of Shannons in Swords, we slurped down some soup at the pub. Then we headed to the suburbs of Swords (to pick up a used chair I’d secured on http://www.adverts.ie). It’s not the most comfortable office chair… I have to admit that on-line viewing leaves much to be desired. But, I took it anyway as we’d made quite an effort to get there. If it doesn’t suit for long stints at the computer, perhaps I can re-list it on Adverts. We had rented a car–to use for our trip to western Ireland–and to make a few errands. After our chair purchase, we found we had a couple of hours to spare before we needed to pick up my sister, Heather, at the airport. We decided to make a quick trip to IKEA. I was thrilled to find the same model of desk I use at home… it will fit snuggly in the corner of my living room and I can transform into a cafe table for use on the balcony in good weather. Heather was surprised by coolness of the weather here. She just spent a sweltering 16 days in drought-ridden Italy. The mountainside across from her Spoleto lodgings went up in flames and burned for two straight days. In Rome, she stayed with the hostellers I use on my student trips. Our friend Monti showed her around the city… including some hair-raising rides on the back of his motorcycle. Glad I wasn’t there to see that! Dave and I enjoyed a ride with him in his car and that was hair-raising enough for me! Here, she’ll be borrowing sweaters. She’ll also have to dig that umbrella from the depths of her suitcase. After collecting Heather outside customs, we all hurried back to town to meet some people I’d hired to help clean the apartment. They know a bit more about this particular job than I do. The place feels much cozier now! Sadly, though, I still haven’t figured out the sizing for the beds. I keep buying sheets that don’t fit. Two twin beds zip together to make one “super king,” but these are longer-than-normal twins and I can’t find anywhere to buy long twin (i.e., dorm) sheets. I’ve learned all this through trial and error and I still lack some of the bedding I’d hoped to have in place before Heather arrived. Dave and I will huddle together for warmth tonight. If, of course, he ever finishes editing and comes to bed… people keep ordering new images. They all want to enter an architectural design competition that closes soon and they need exceptional images (that he’s previously shot, was smart enough to bring with him, and now needs to edit). Even though we’ve been intensely busy the past few days, we’ve stumbled across some interesting sights along the way. There’s movie filming going on all across the city and a Notre Dave versus Navy football (!?!!?) game in Dublin this weekend that has brought in throngs of Americans. 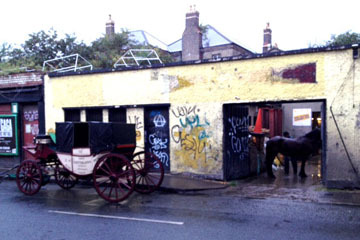 We also spied the stable for a old-timey horse-drawn carriage. I posted a photo (at the top of this blog) of the owner washing his horse last night. We were walking to find a place recommended by Peter (from the Kildare Street Hotel). 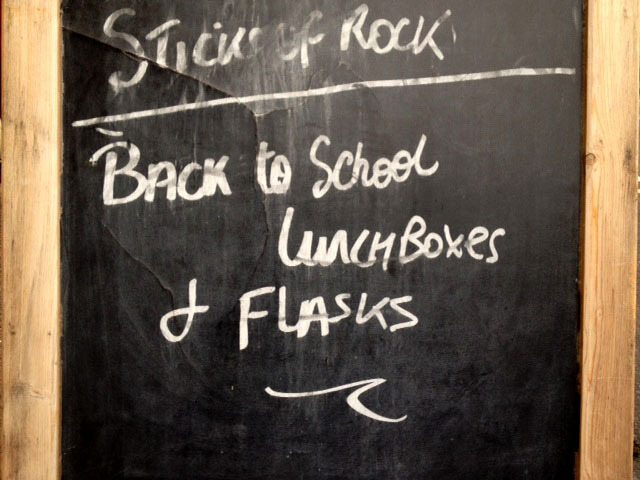 I’m so glad to have his ideas… this funky little restaurant pub is quite close to where I live. It has fascinating accouterments (such as the menus in the photos above). You’ll notice that Dave got a little wet on our walk there. He dried, eventually! What we haven’t found yet–sorry Morgan–is Lucky Charms. Despite having a large section seemingly devoted to Kellogg’s, the Fresh Market has no sign of such Charms. We did locate readymade pancakes in the refrigerated section, however. They’re available in either “American” or “French.” As Morgan’s dad would say “Who’d a thunk?” Certainly not me! Getting moved into an apartment hasn’t been the smoothest process. The size and location of the one I’ve selected are great. The price is reasonable for the market ($1200/month furnished). But the landlord is difficult. He believes the apartment was already “professionally cleaned,” but the carpet hasn’t been vacuumed let alone steam cleaned (which it needs even by my not-so-high standards). In any case, I’ll be taking on a fairly dirty apartment and cleaning it myself. The good news is that I should be able to move in tomorrow. 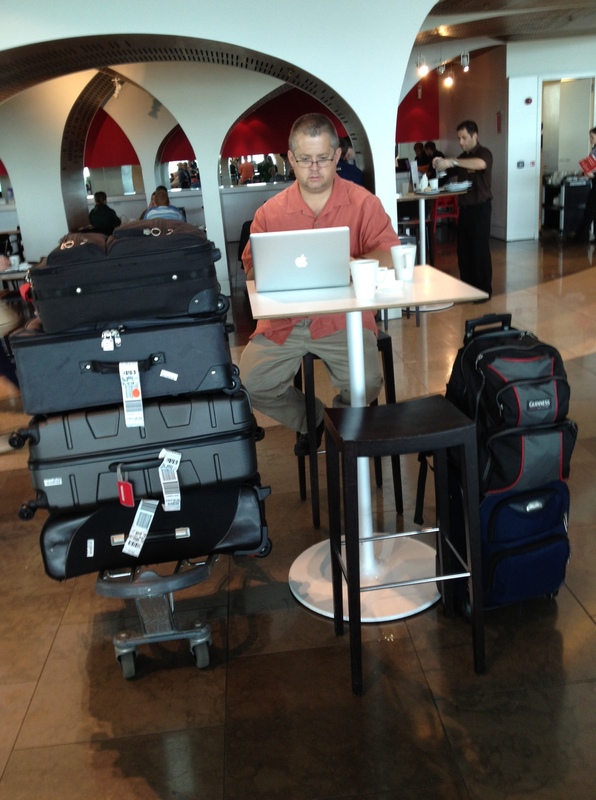 Dave and I will haul all our bags across town… somehow. I’m hoping to arrange a large taxi. Fortunately, most everything else about this move has gone much more smoothly than securing the apartment. The people at the Kildare Street Hotel (most notably, Peter and Mark) have been absolutely the best!!!! They are full of helpful information and insight. They’ve helped step me through this move. My iPhone now has calling capacity and roaming Internet connection. Today, the apartment management company and I were both paid. That means I was able to apply for a bank account, since I can now claim to have a home address. By Friday, I’ll have access to Euros instead of having to spend US Dollars. That means I can buy things and pay in Euros. I’ll be able to avoid paying the fees associated with buying Euros (due to exchange rates and international transaction charges). 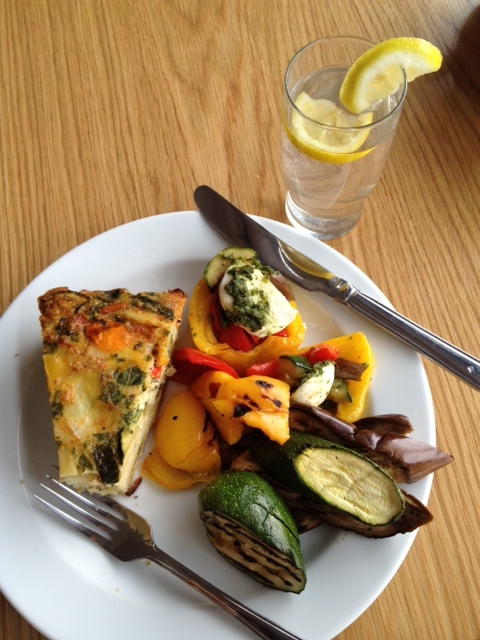 Something else that has made all this easier: delicious food is readily available! Lest you think all the meals here are laden with calories, I’ve attached a photo of the lunch I had at 4 pm today (after many meetings). It was vegetarian and gluten-free. There are many gluten-free options in the restaurants here. That’s because, unfortunately, Ireland has the highest number of people, per capita, who are celiac and can’t eat wheat proteins. Many can’t even eat from a kitchen where wheat has been used. I fear that we’ll see a rise of gluten intolerance in the States, because our standard American diet today is so high in gluten. I think people are likely to reach their thresholds at some point — like I did with formaldehyde. In any case, the open air market here is full of summer vegetables at amazingly low prices (5 red bell peppers for €1). Restaurant food nation-wide is quite expensive, however. My lunch (as pictured) cost about $12. Looks like I’ll be eating at home a lot! I captured a few more images of curving streets on our walk to dinner last night. I mentioned yesterday that Camillo Sitte recommended the urban designers include non-straight streets. The urban design students I taught this past summer used Sitte’s principles to guide their designs for a new (theoretical) plaza in Rome. You can see their proposals at Urban Push. Two of the images below feature landmarks around the bend in the street. 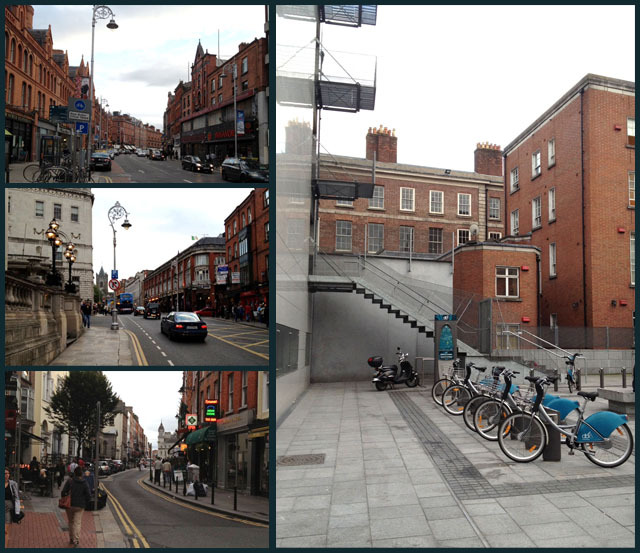 In the photos below, you’ll also see that Dublin has bike share. If I find the drop-off locations to be convenient, I’ll join the program. I’ve heard it’s just €10 per year. Remembering to drive on the left is pretty difficult for me when I’m not in a car, though, so it may be a while before I’m up for riding a bike in the city. I actually had no problem driving a car on the left side when I rented a manual transmission auto for two weeks in 2003. The most difficulty I had that year was remembering to convert back to right-handed driving when I got back home. “Take a picture every time you see something that surprises you,” the International Four-H Youth Exchange had instructed me when I was an IFYE to Switzerland in 1994, “because after a few days that thing won’t seem unusual to you and you’ll forget to take a picture.” I recalled that advice today after the Facebook image of my “mini” Irish breakfast raised eyebrows among my friends back home. After eating dozens of these meals over the years, I’d nearly forgotten that beans on the side seem unusual to the American palette. But our cat-sitter, Morgan, posted a query about our choice of side items. She’s the person who asked me to bring back some Lucky Charms (her favorite boxed cereal product). I guess she’ll be surprised when the luck I bring her comes in a can! After breakfast, Dave headed back to work editing photos. He’s at in non-stop these days, to meet deadlines back home. I did a bit of shopping on my own (again) in preparation to move into the new apartment. Today, I went shopping on Grafton Street. 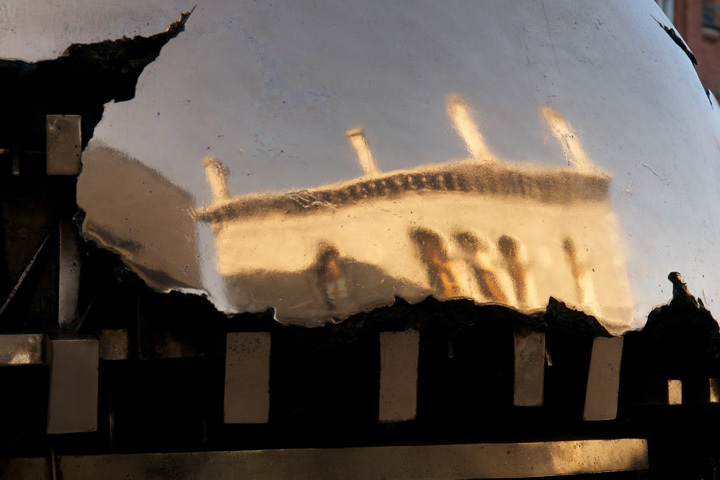 I’ve posted reflections from the area. The one (to the left) reminds me of the importance of landmarks in creating a beautiful townscape (an idea of Gordan Cullan’s) and of using landmarks to help people orient themselves in the city (as explained by Kevin Lynch). See how effective the church is in providing a visual cue to your location? And how the curved streets provide a sense of mystery (as recommended by Camillo Sitte)? The reflection on BT2 I captured today (shown to the right below) was completely different from the one I posted yesterday (to the left). After that, I was off to a tour of the Freemason Hall just up the street from our hotel. The tour was offered as part of National Heritage Week. I learned so much from the guide! I’ve posted some photos of the building–which serves as the headquarters for all of the island’s Freemasons–in honor of my Hampton University office-mate, David Perronet. For now, I’ll get this posted and try to pry Dave from that computer so we can enjoy the last few moments of sunlight today. 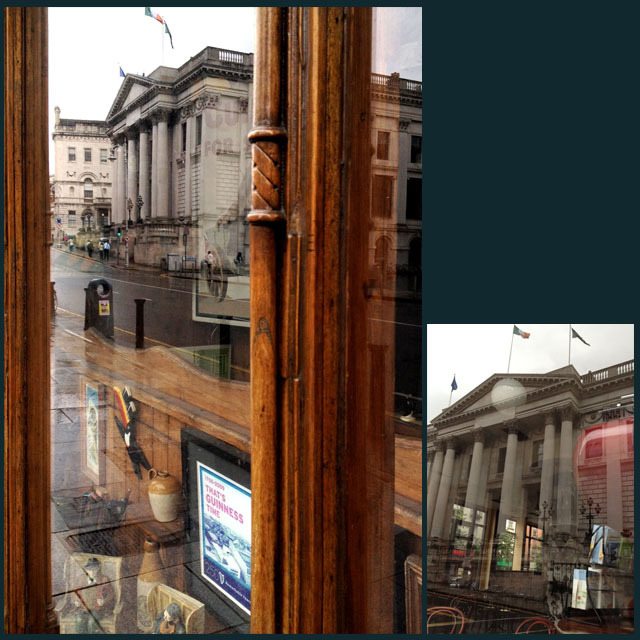 Reflections of old City Hall in shop windows along Dame Street (© Shannon Chance, August 2012). 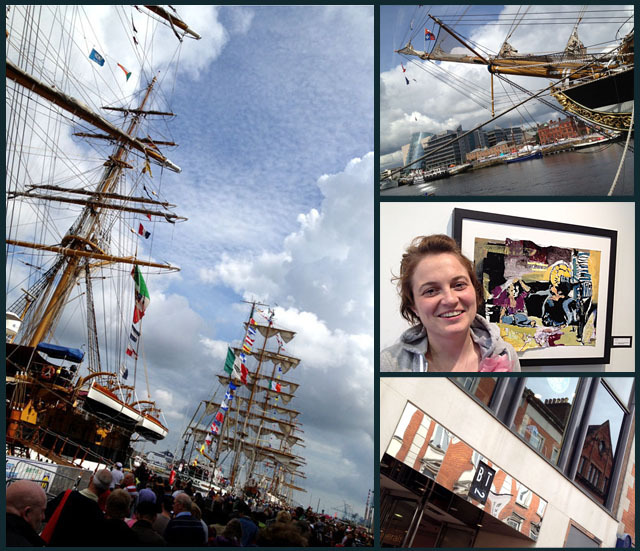 Tall Ships along the River Liffey in Dublin (© Shannon Chance, August 2012). Visiting artist Aga Szot at her exhibition “Punctuation.” One of Aga’s original paintings hangs in our home in Portsmouth. BT2 storefront reflection (© Shannon Chance, August 2012). 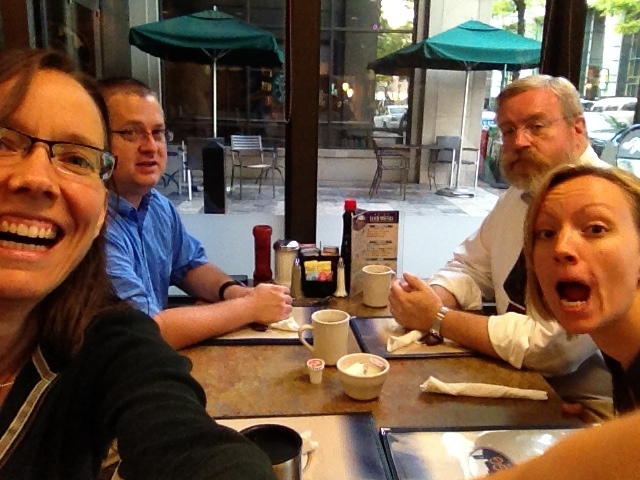 Our Norfolk breakfast club — Shannon, Dave, Wayne, and Morgan. Not much time for reflection today – we hit the ground running. After a lovely farewell breakfast in Norfolk with Wayne, Rose, and Morgan Ringer, we spent much of the day flying to Ireland. We enjoyed spending the first leg of our flight with Glen McClure, who is now in Westport partaking of breath-taking views of the Atlantic Ocean. After waiting at Dublin airport in the longest passport control line I have ever encountered, we successfully cleared customs using my brand-spanking new Irish work permit. We sipped coffee at the airport while setting up appointments via Skype and then headed into town. 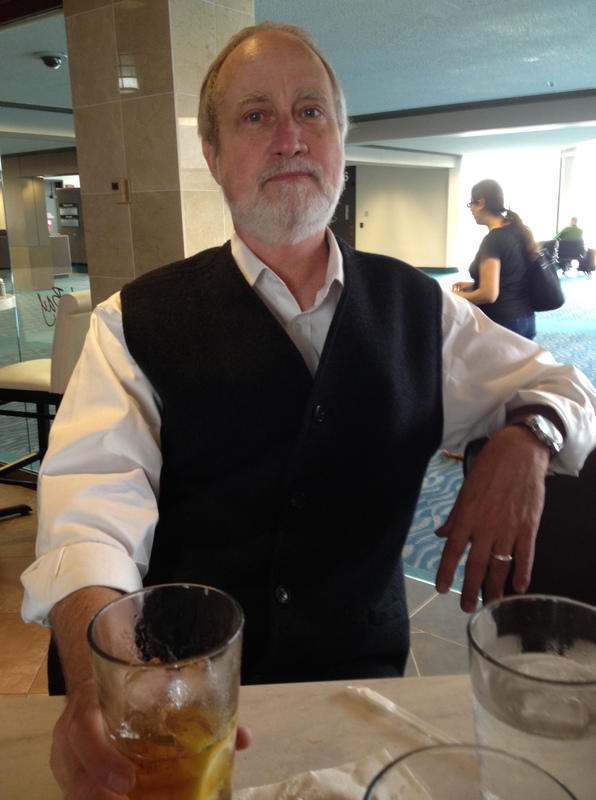 Lunch with Glen at the Norfolk airport. After a quick lunch and a splash in the shower, we were off to find new digs. We sprinted to our first apartment viewing. I loved the apartment. I was certain I would as I’ve scoured the Internet for weeks to find it. 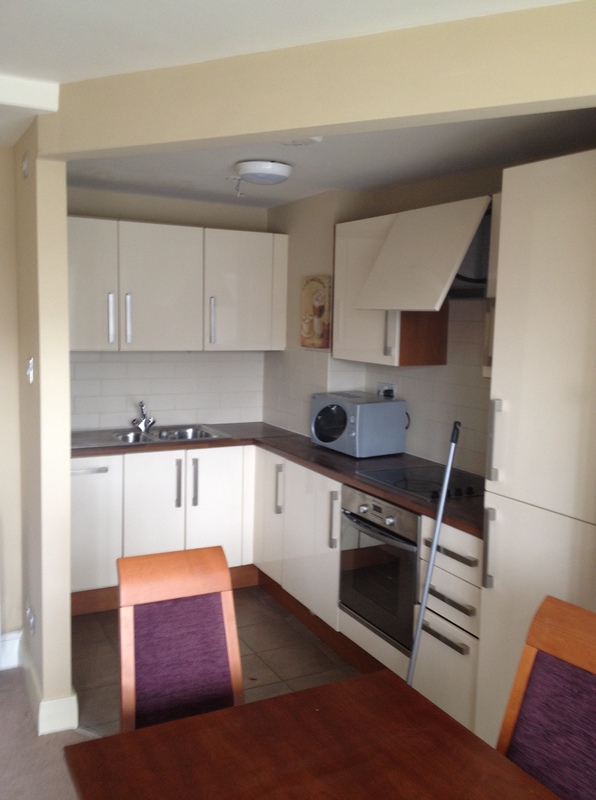 I know the market, and I am pleased with the space, layout, views, sunlight, and appliances in this particular unit. I tentatively agreed to take it. Dave with our luggage after clearing customs at Dublin airport. We decided to keep the second viewing I had booked, but since we had a little time on our hands, we stopped by the yoga studio I’m hoping to use and got a tour from a Brazilian fellow namedWellington. We also went and got two new cell phone numbers. The second place we visited was also very nice. It’s located on the grounds of King’s Inn Law school. Being that the stone row house was built in the 1500’s, and today’s weather was quite balmy, the house felt cold to me despite being bright and sunny. I’m sticking with the first one, but hope to hang onto the new friend I met there (another Dave who clearly loves this place and gave us a very fine tour). We’re currently recuperating. I now await a dinner of Guinness Pie… having just pried Dave from his jet-lag-induced afternoon slumber. What I hope will become my new kitchen. 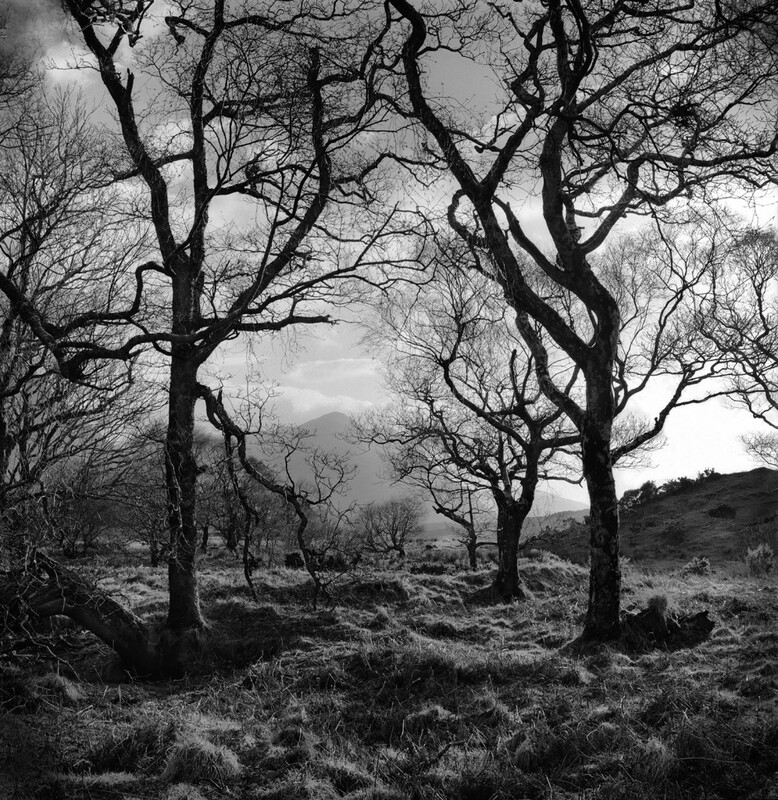 Glen McClure took this photo in County Mayo, Ireland. It’s available on his blog. The day has finally come. My bags are packed, I’m checked in for my flight, and I think I’m ready to fly. I can’t say the same for Dave, who is still furiously editing photos. He’s been working day and night for weeks to meet his clients’ needs and help me get my computer equipment in optimal working order. Unfortunately, he hasn’t yet started to pack. But no worries… we’ve got 10 hours until we have to bid adieu to our kitties and hit the road. Marshall McClure, the beautiful and talented owner of Parke Press, will be driving us to the airport. We’ll be flying partway to Ireland with her husband, Glen. He will split from us at JFK because, while we as landing in Dublin, he’ll be landing in Shannon. He is going to spend a couple of weeks doing what he does best… photographing landscapes, people, and the occasional building. He often travels to the western side of Ireland to do so. Dave and I have our work cut out for us in Dublin. We’ve got get the essentials for living in place. 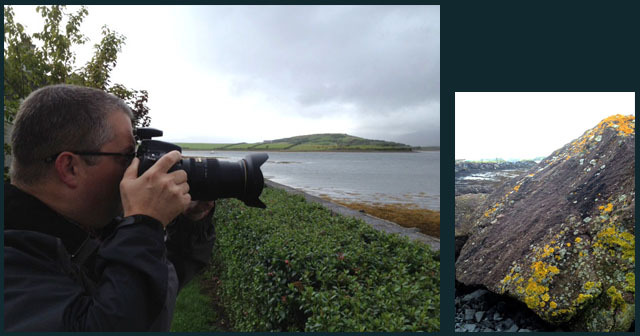 Once settled, we plan to join Glen on the western coast of Ireland for a few days. I’m looking forward to our little camera and Guinness club. I’m just wishing Marshall was going to be there with us, too. She’s one of my all-time favorite people and the party’s not going to be complete without her. Wish us luck with apartment hunting! We’ll let you know how it goes….